PARIS -- Renault is pushing ahead with its plan to name a new director to the board of Nissan and safeguard power within their car-making alliance, signaling mounting tension between the two companies almost a month after the jailing of leader Carlos Ghosn. “Renault wants to exercise the possibility to name its directors and this will be done at a shareholders’ meeting,” Martin Vial, a Renault board member and head of the agency that holds the French government’s stake, said in an interview Tuesday on BFM Business. 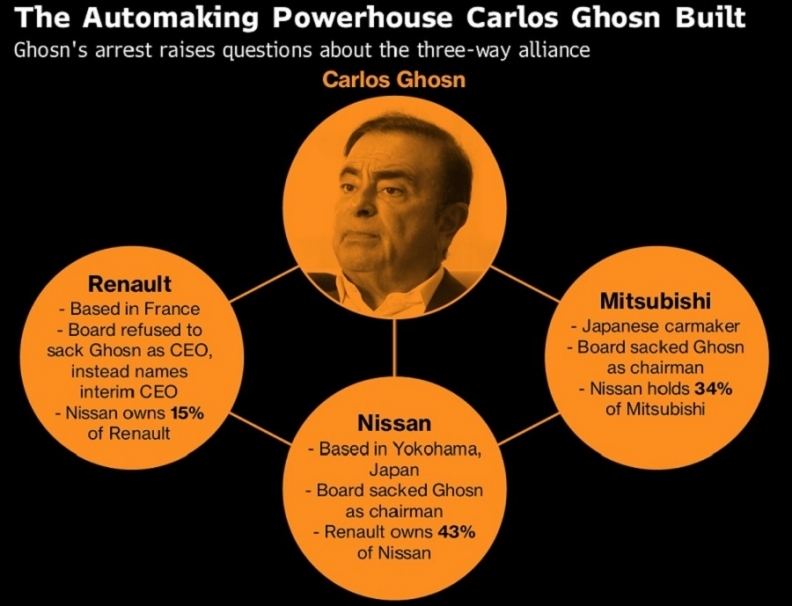 Through complicated cross shareholdings, Renault owns 43 percent of Nissan and has three board members including Ghosn, who was indicted in Japan for financial crimes. The comments served to highlight a growing rift between the French and Japanese manufacturers over their respective powers within each others boardrooms. On Monday, Nissan Chief Executive Officer Hiroto Saikawa rebuffed the French carmaker’s demand for a meeting of all shareholders to discuss Nissan’s governance, something it would need to do to change its board representation. “It’s not a fight,” Vial said. “Renault has rights over Nissan as a shareholder” and will exercise them to replace Ghosn on the board if we have to. Saikawa traveled to Amsterdam for a meeting starting Tuesday of the alliance between Nissan, Renault and the third partner, Mitsubishi Motors Corp., according to a person familiar with the plan, who asked not to be identified as the information isn’t public. The last time the carmakers met -- soon after car titan Ghosn’s arrest and ouster as Nissan’s chairman in November -- Saikawa, 65, chose to attend the gathering by video. At the two-day gathering, the CEO will have a chance to personally give a detailed explanation of the events that led to Ghosn’s indictment by Japanese prosecutors on allegations he understated his income. Renault, Nissan’s largest shareholder and the company that bailed out the Japanese automaker two decades back, has been pressing for specifics, as has the French government. Vial reiterated the demand Tuesday. Ghosn’s arrest has created a climate of suspicion between the companies, whose alliance has been held together by the high-flying car executive for two decades. While Nissan ousted Ghosn, Renault technically kept him on as chairman and CEO while it seeks more information and evidence about the accusations. Ghosn, 64, also remains head of the alliance. Both Nissan and Renault have repeatedly said they are committed to the car alliance, the world’s largest. Nissan, though, has long been unhappy about what it considers an outsized French role in the partnership, and is seeking to redress perceived imbalances, people familiar with the matter have said.